So now I have studied and reproduced already many different styles of data plates. These plates are absolutely 100% correct for the WWII MB/GPW jeep. I used the exact materials, in the right thickness, and the same letter style as on originals. The fonts are not ready made fonts from the computer, but every letter is redrawn from original plates. 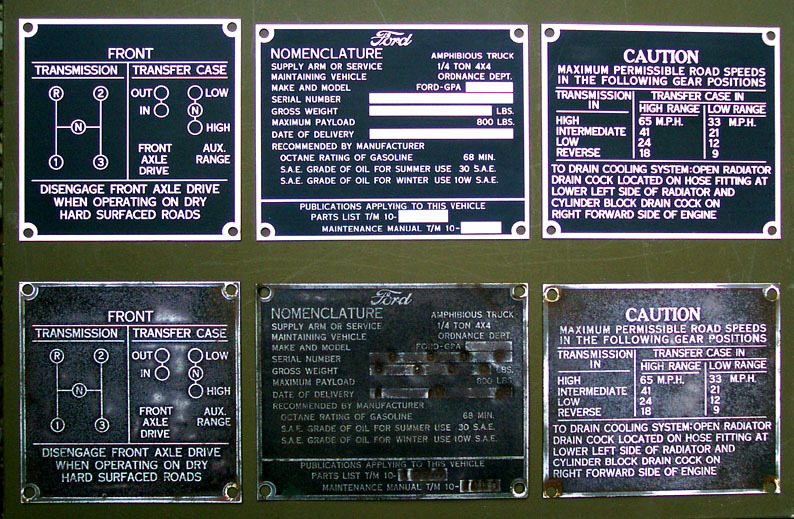 These are absolutely the best you can get, you restoration deserves the little extra attention to detail that these data plate will bring. Please ejoy this website, if you like the read all info about dataplates in chronological sequence clic on the little jeep.